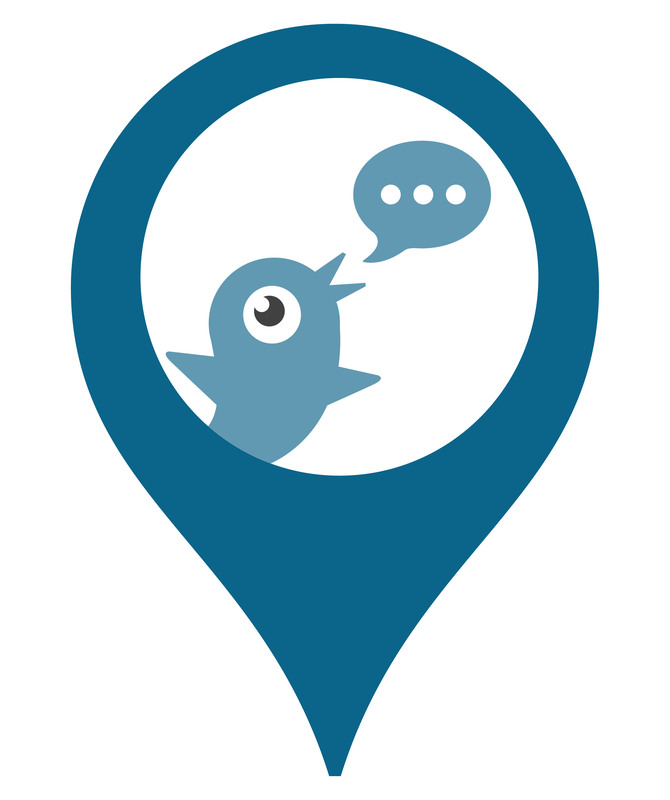 Learn how to connect with journalists on social media. Get the free report today! 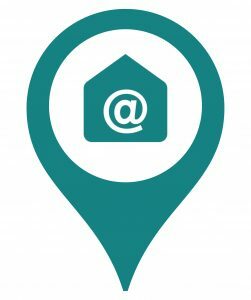 The fifth annual Social Journalism Study, conducted by Cision and Canterbury Christ Church University, tracks the ways social media affects journalists and media professionals in both their work and in their communication with PR professionals with data gathered from the United States, Canada, Finland, Germany, France, Sweden and the United Kingdom. In it, we’ll provide an in-depth look at journalists’ perspectives on social media in these seven countries and how their understanding and usage of it has evolved. We’ve categorized the surveyed journalists into five main groups based on their professional and demographic characteristics, as well as their attitudes towards social media. We’ve also divided the key findings from U.S. and international journalists. Examining these and other findings in more detail highlights the differences between the various types of journalists and how they view and use social media in order to help optimize communication between journalists and PR professionals. Over the past five years, the Social Journalism Study has identified five types of social media users amongst U.S. journalists: Architects, Promoters, Hunters, Observers and Skeptics. (click to tweet) These groups continue to exist today and are determined by journalists’ use, views, attitudes and behavior toward social media, PR professionals and their own profession. "Journalists believe social media is most important for publishing and promoting content and interacting with audiences." The majority of survey respondents see social media as important or very important for most of their professional tasks. More than half (58 percent) rate social media as very important for interaction, and nearly two-thirds (62 percent) feel it is very important for publishing and promoting content. 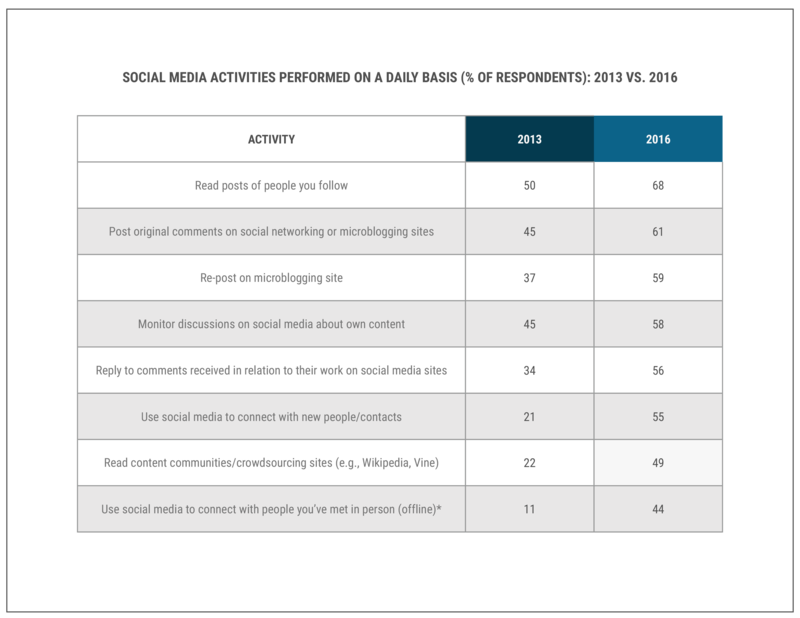 (click to tweet) Looking at the most commonly performed social media activities, like monitoring discussions about content and reading followers’ posts, we see that a larger proportion of respondents are using social media for these tasks compared to three years ago, when the 2013 survey was conducted. The majority (68 percent) of U.S. respondents report using at least three types of social media for publishing and promoting, and nearly half (47 percent) said they used four or more. (click to tweet) In addition, 51 percent said they used three or more different types of social media for sourcing. 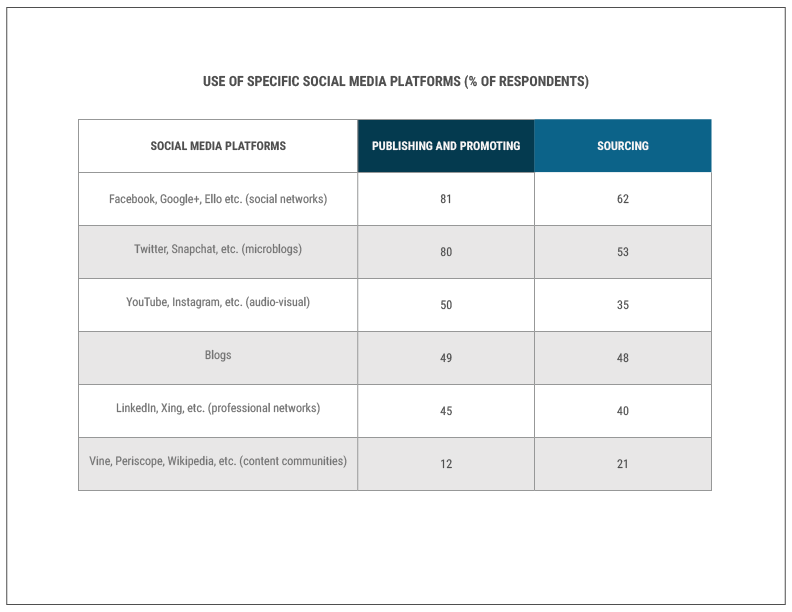 Here’s a breakdown of the social media platforms journalists use for publishing, promoting and sourcing stories as well as the categories they fit into: Although the popularity of social networks and microblogs is a common theme for all journalists, there are differences depending on journalists’ professional and demographic characteristics. For younger journalists, audio-visual sharing platforms, like YouTube, are the third most commonly used tools. Older journalists, however, use professional networks like LinkedIn. Social media is embedded in the everyday workflow of U.S. journalists. Nearly half (48 percent) say they would be unable to carry out their work without it. (click to tweet) This is an increase from 2013 when 41 percent of respondents felt this way. 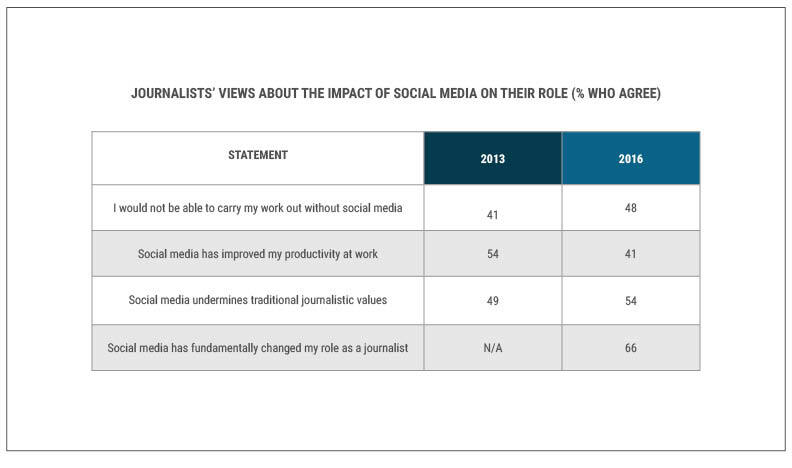 While 66 percent of U.S. journalists think that social media has fundamentally changed their roles, the table below illustrates that there has been a 5 percent increase in the proportion of respondents who feel that social media is undermining traditional journalistic values—from 49 percent in 2013 to 54 percent in this year’s survey. The Influence of Social Media Usage One factor which appears to influence journalists’ views about social media is how often they use it. As illustrated below, there is a positive relationship between the amount of time journalists spend on social media and how they feel about it. 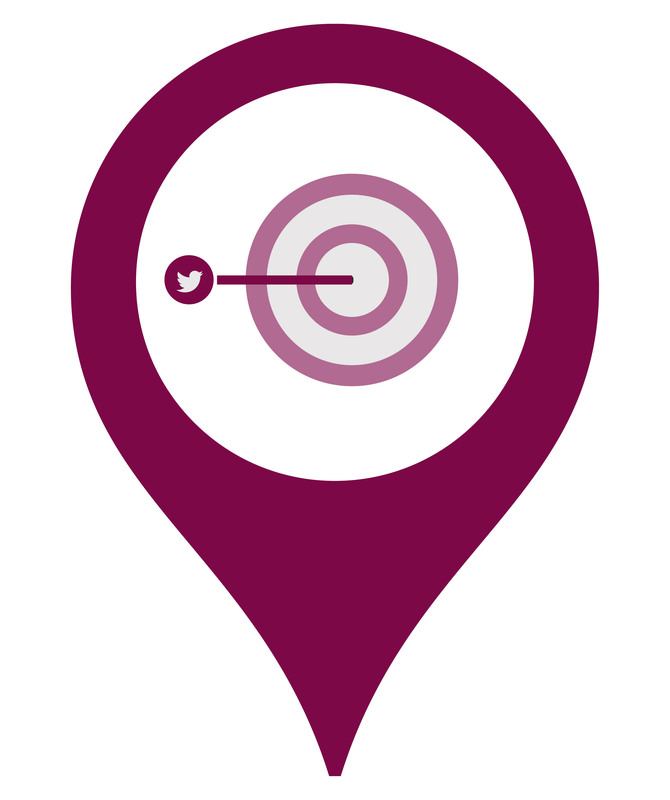 As mentioned earlier, audience interaction is widely reported as a key benefit of social media. 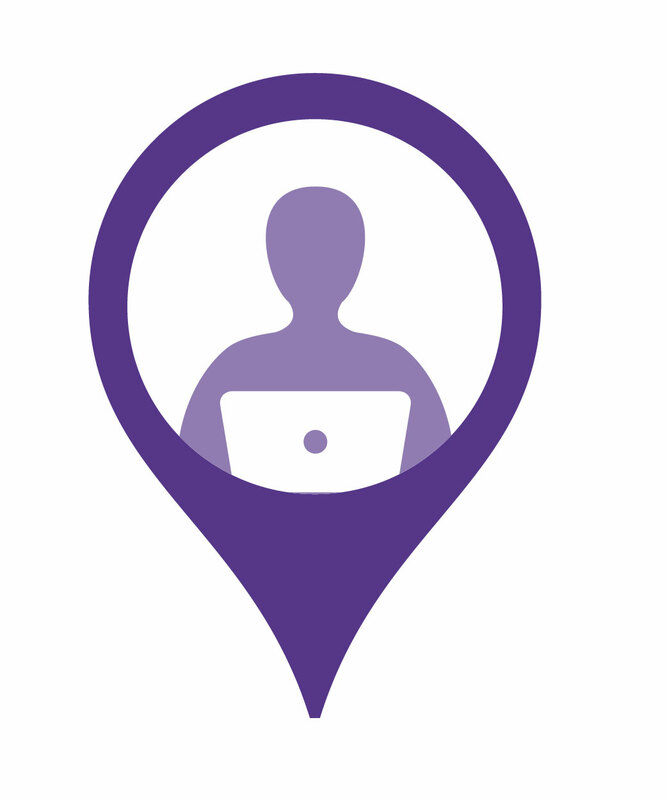 More than three quarters of U.S. respondents (78 percent) feel social media has enabled them to better connect with their audience. (click to tweet) Social media is often seen as a vehicle for a mutually beneficial relationship between journalists and their audiences, with the audience becoming an important source of information. However, the findings here show limited support for this trend. While 52 percent of U.S. respondents said they plan on increasing their use of social media in the future, only 29 percent said that they intend to use crowdsourcing and user-generated content more, meaning that more than two-thirds (71 percent) do not. 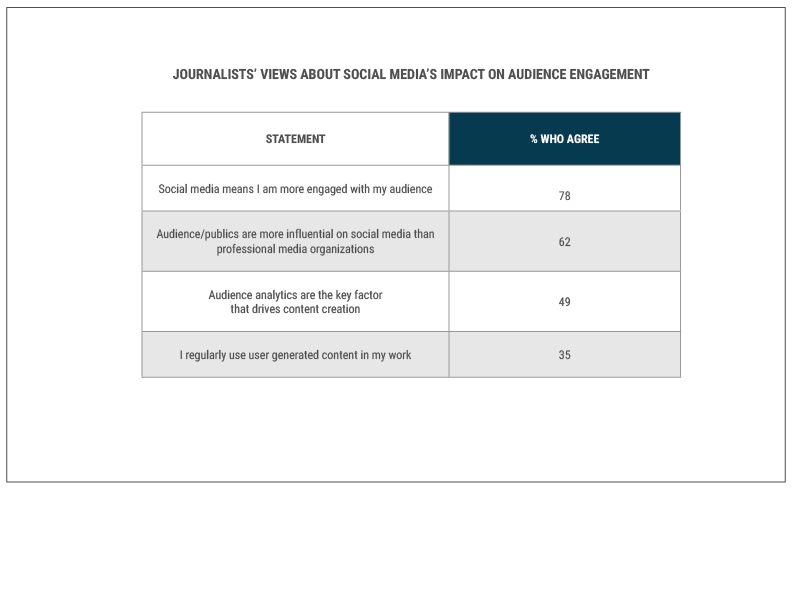 There is a significant difference between freelance and full-time employed journalists in whether they agree that audiences have more of an influence on social media than professional media organizations (73 percent versus 55 percent, respectively). 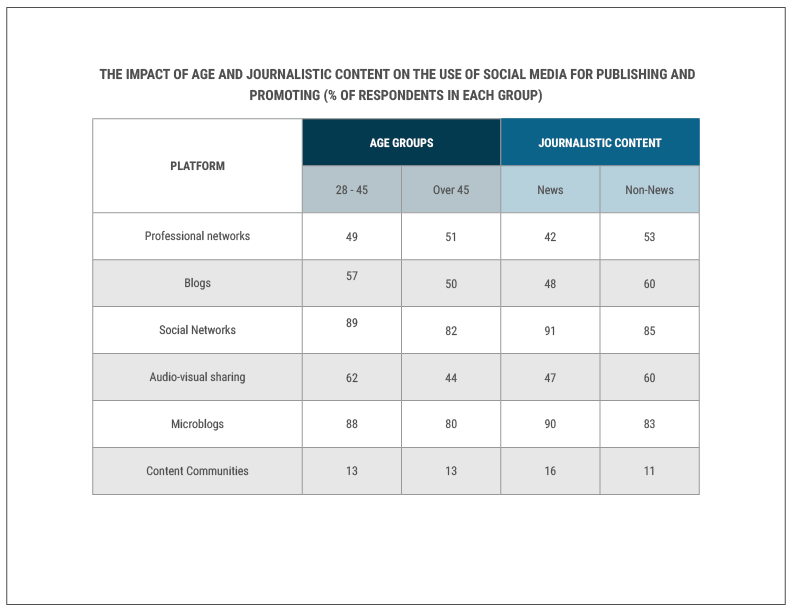 Age also has an influence on journalists’ views and practice of user-generated content. 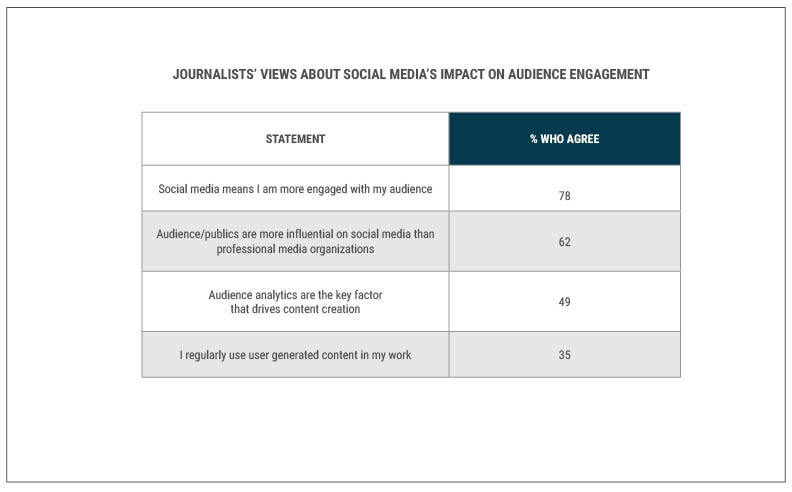 Journalists ages 28 to 45 say social media has made them more engaged with their audience (81 percent) with 40 percent making use of user-generated content in their work, compared to only 30 percent of those over age 45. PR professionals/press releases are one of the most important sources for U.S. journalists, with 42 percent considering them to be a main source of information. (click to tweet) However, industry and professional contacts (51 percent) and experts (47 percent) were perceived to be more important sources Younger journalists (55 percent) were more likely to say that PR professionals are their main source of information than older journalists (41 percent). More than half of online journalists (53 percent) also say this, compared to 44 percent of traditional journalists, those whose main body of work does not appear online. News journalists (88 percent) were also particularly likely to feel positively toward PR professionals, compared to non-news journalists who produce features, editorials and reviews (74 percent). Younger journalists were likely to agree that PR professionals are a reliable source of information (53 percent) and that they enhance the quality of their reporting (51 percent). While journalists prefer to communicate with PR professionals via email, the second most common method of communication is phone, though journalists would prefer less contact via this method. Social media is the second most preferred among journalists. (click to tweet) The use of email and newswires, in terms of current and preferred methods of communication, is consistent for all journalists, but other forms of communication show differences depending on professional and demographic characteristics. For instance, news journalists show the largest preference (10 percent) for face-to-face communication with PR professionals. Journalist Age and Social Media The relationship between age and social media is particularly noticeable. Younger journalists are twice as likely as older journalist to communicate with PR professionals via social media, the latter of whom would prefer less contact through social. 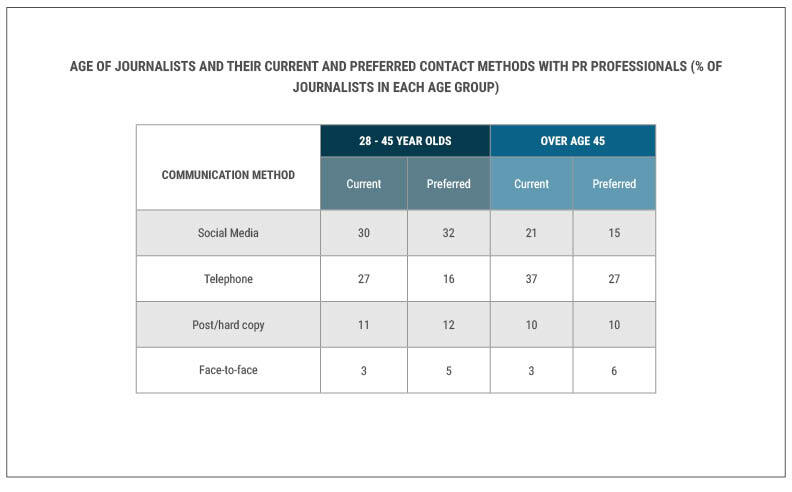 The chart below illustrates the current and preferred communication methods by journalists of each age group. Freelance journalists are the only ones who want more telephone communication with PR professionals, and are also the most likely to say they use social media to communicate with PR professionals (37 percent). 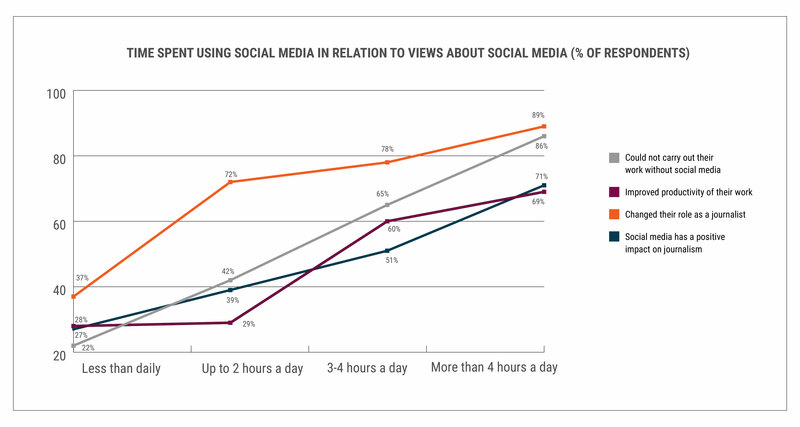 Frequency of use across the seven countries was fairly consistent with the majority of respondents reporting they use social media for two hours a day. (click to tweet) The U.S. and Canada had the highest figures with 31 percent of respondents using social media more than two hours a day. Interestingly, Sweden has the most fervent social media users with 15 percent of respondents, the highest of any country, using social for more than four hours a day. However, 27 percent report only using it on a weekly or monthly basis. France had the highest number (9 percent) of those not using social media for work, though 59 percent believe they will use it more often in the future. Journalists use a variety of platforms depending on their tasks and country. With the exception of France and Finland, the majority of respondents surveyed use at least three social media platforms for publishing and promoting their content. 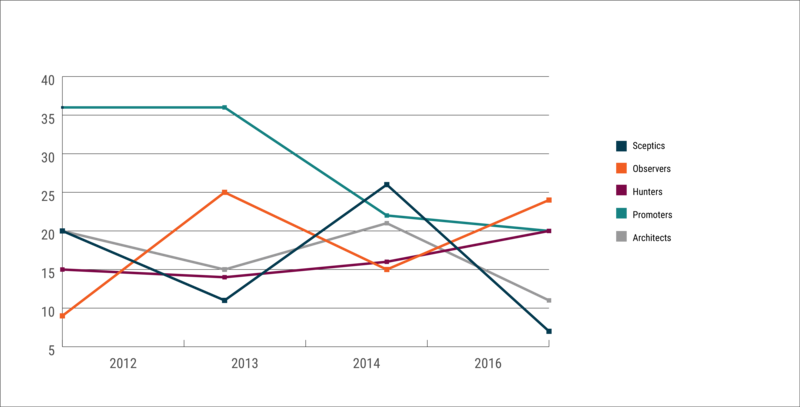 Preferred Platforms for Publishing and Promoting Content Respondents in five of the countries prefer social networks followed by microblogs. Most respondent also find audio-visual sharing sites to be the third favorite platforms for publishing and promoting content, with the exception of journalists in France and the U.K., who find professional networks more popular. 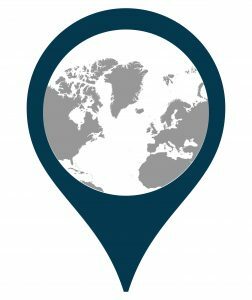 Where Journalists Source Content Most countries prefer social networks for sourcing, with the exception of journalists in France and the U.K., who prefer microblogs as defined in Finding 3 of the U.S. results. (click to tweet) However, the actual proportion of journalists who say they use blogs shows large variation between the countries, with France and Sweden having the smallest group of respondents using them for both sourcing and for publishing and promoting content. 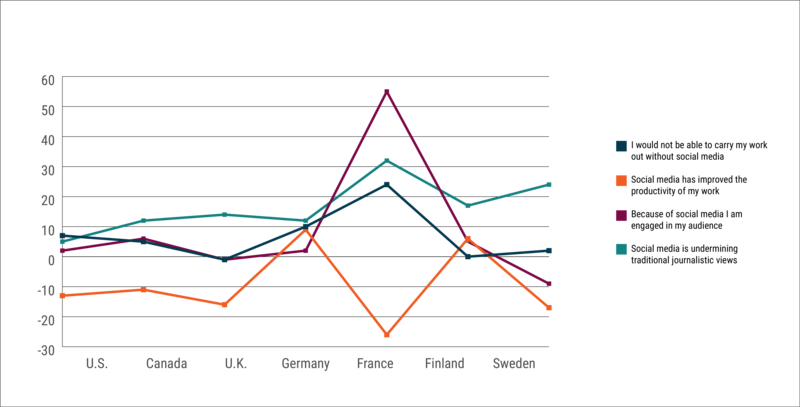 Conversely, respondents in Finland are among the least likely to say they use blogs for publishing/promoting their content, they are the most likely to say they use them for sourcing. 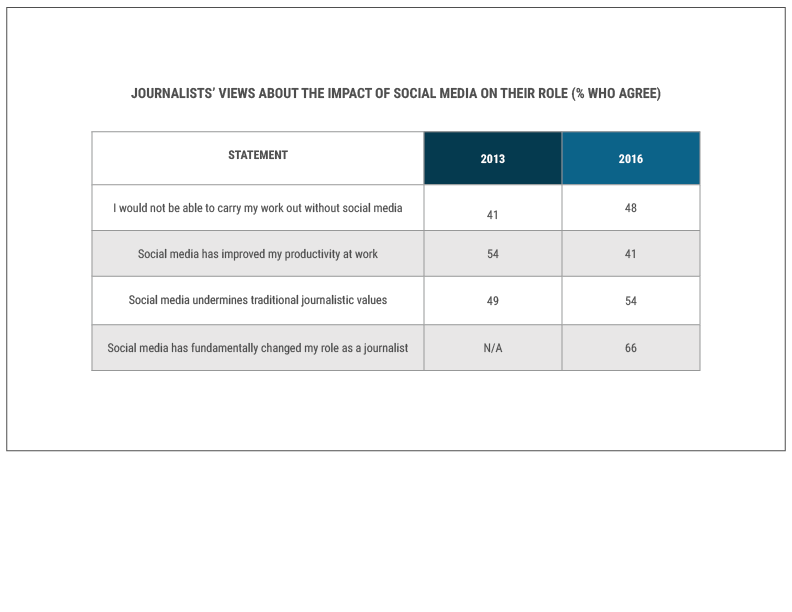 When asked about the impact of social media on their work, the majority of journalists in each country agree that social media has fundamentally changed their role and enabled them to be more engaged with their audiences. However, they tend to disagree that it has made them more productive in their work. 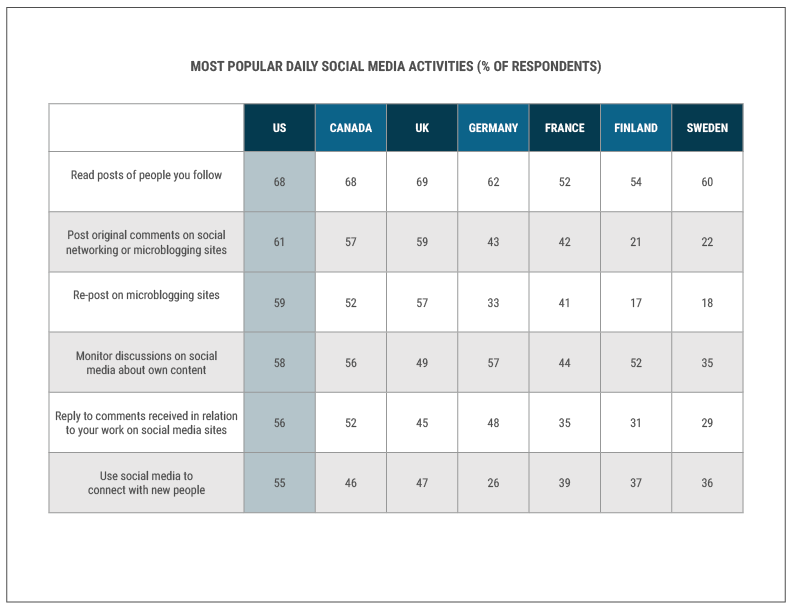 Only in Canada and France did more than half of the respondents agree that they could not carry out their work without social media. 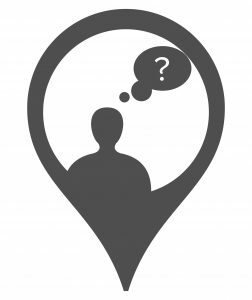 While the majority of respondents feel that they have a good relationship with their PR contacts, they do not view them as reliable sources of stories, nor do they think they enhance the quality of their reporting. (click to tweet) U.K., U.S., French and Canadian journalists were the most likely to see PR professionals as reliable sources of stories. When asked who their main two sources of information were, respondents in Germany and the U.K. were most likely to name PR sources and press releases. Those in the U.S., Canada, France, Finland and Sweden turned to experts, industry professionals or other media. Cision and Canterbury Christ Church University conducted an online survey about the uses, behaviors, attitudes and perceptions of social media amongst journalists. Respondents were found using Cision’s and Gorkana’s media database of more than 1.5 million influencers globally. This report is based on 300 responses from U.S. journalists and media professionals collected between February and April 2016. It also provides an international comparison with journalists and media professionals from six other countries surveyed during this time, including Canada (246 responses), Germany (360 responses), France (290 responses), the U.K. (418 responses), Finland (254 responses) and Sweden (144 responses). Throughout the survey the term ‘journalist’ is used to include all media professionals, e.g., researchers, editors, bloggers, etc., who took part. The survey is designed to enhance the media industry’s understanding of social media uptake and the impact of social media technologies and processes on journalists’ work. Gorkana and Cision conduct this survey on an annual basis to continue to inform on best practices within the PR and communication field and to deepen the industry’s understanding of how journalists and professional communicators use and value social media compared to other resources. The research examines patterns of social media adoption by journalists, how and for what social media is used, and how they view the impact of social media on the profession. Cision is a leading global media intelligence company, serving the complete workflow of today’s communication, social media and content marketing professionals. Offering the industry’s most comprehensive PR and social software, rich analytics and a Global Insights team, Cision enables clients to improve their marketing and strengthen data-driven decision making. Cision also represents the Gorkana, PRNewswire, PRWeb, Help a Reporter Out (HARO), and iContact brands. 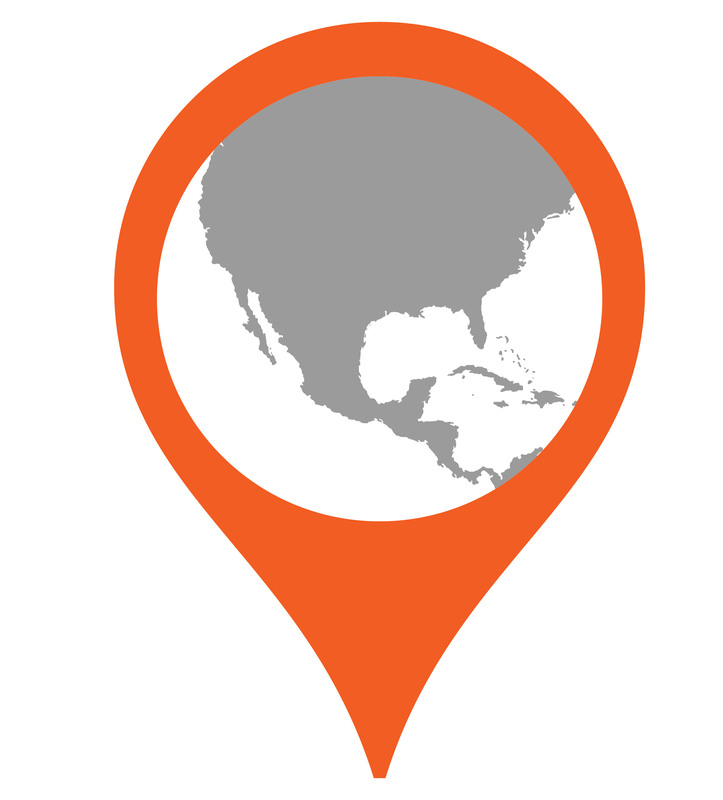 Headquartered in Chicago, Cision has over 100,000 customers worldwide and maintains offices in Canada, UK, France, Germany, Portugal, Sweden, Finland and China.